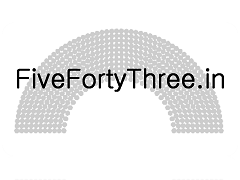 FiveFortyThree: FiveFortyThree.in projects NDA to win 231, UPA to win 140 and OTHERS to win 172 seats. FiveFortyThree.in projects that the NDA will win 231 seats in the forthcoming Lok Sabha election. The UPA is projected to win 140 seats, with Other parties winning 172. These forecasts are based on a poll aggregation of opinion polls presented from January 2013 until March 2014 by leading pollsters such as CSDS, CVoter, Hansa, IPSOS and AC Nielsen. Only those pollsters with a reputation gained from having presented in previous elections were included. Pollsters who have only presented for the first time in this election cycle or who presented no details on sample size and methodology were excluded. Further, our poll aggregation was based on the state level only. Pollsters who only provided national seat projections were excluded. Based on our analysis of previous election forecasts, we knew there was a higher level of accuracy based on state level forecasts. For any gaps in the state level forecasts, our seat safety predictions based on the last four election cycles were utilized. In fact, this was only required for smaller States and union territories which nearly always tend to vote in a predictable manner. The table below presents these forecasts at the state and union territory level. Based on these forecasts, it is clear that a hung parliament is predicted and that the NDA will need to reach out to regional parties presently grouped in the OTHERS alliance if these forecasts are correct. More details will be provided on our methodologies in forthcoming blog posts. Could China lose from India's abstinence?